Recall Alert: Honda Gold Wing Recall | Hupy and Abraham, S.C.
American Honda Motor Co., Inc. has issued a recall for 882 Gold Wing motorcycles. 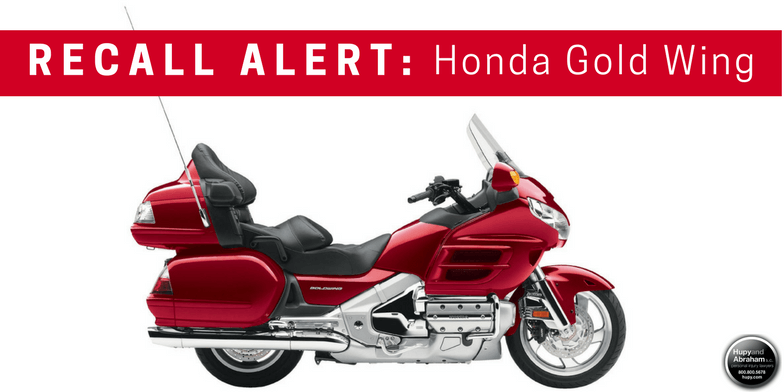 The recall spans certain models from 2006-2009 and 2012 Honda Gold Wing GL1800 touring motorcycles. And 2006-2008 Gold Wing motorcycles sold or registered in Alaska, Colorado, Connecticut, Idaho, Iowa, Maine, Massachusetts, Michigan, Minnesota, Montana, New Hampshire, New York, North Dakota, Oregon, Rhode Island, South Dakota, Utah, Vermont, Washington, Wisconsin and Wyoming. Honda recall announcements indicate that the front air bag inflators assembled as part of the air bag modules used (as original equipment or replacement equipment) may rupture if deployed during a crash, which could result in metal fragments striking, injuring or killing the rider. According to Honda, this rupture is due to propellant degradation occurring after long-term exposure to humidity and fluctuation temperatures from the motorcycle. The recall, number KE5, began January 24, 2017. Honda will notify owners, and dealers will replace the air bag module free of charge. Gold Wing owners can also contact Honda Motorcycle Customer Support at 1-866-784-1870 for more information. No matter what you ride, at Hupy and Abraham, S.C., we support having fun while staying safe. Order your FREE “Watch For Motorcycles” sticker by clicking here.